Imagine sitting down for a movie. You don’t know what that movie is but when it’s over you realise you’ve been watching a secret sequel to one of your favourite movies of all time. That’s what happened to me when I first saw M. Night Shyamalan’s Split, and it was one of the best experiences I’ve ever had at the movies. With Glass coming out this week, it seemed like a good time to tell my unique, unexpected tale. Though Spilt opened for general audiences in January of 2017, I saw it about four months earlier, September 2016, at Fantastic Fest in Austin, Texas. Fantastic Fest is one of the world’s largest genre film festivals, and it’s both run by, and takes place at, the Alamo Drafthouse. Each year the festival has at least one, sometimes two, Secret Screenings. You have no idea what you’re going to watch until the lights go down and the movie begins. Last year it was Suspiria, but in other years the fest showed Cloud Atlas, There Will Be Blood, Crimson Peak, a tonne of stuff. You never know what it’s going to be but it’s always cool and a big surprise. Back in 2016, it was Split. No matter what the film is, often times, the best part of the Secret Screenings is the speculation. In the days and hours leading up to it, the whole thing becomes a huge, buzzing topic of conversation at the festival. In this instance, late 2016, everyone was dying to see maybe Rogue One or Fantastic Beasts. Now, Disney or Warner Bros. would never screen those, but that’s how wild the hype gets. I even remember people guessing that Rian Johnson could screen a rough cut of The Last Jedi a year a half before it was released because he’d been to the festival before. Moral of the story? The speculation can be exceptionally silly. Eventually, realistic guesses start to join the conversation and even some insider knowledge. In 2016, the big insider tip I heard was that the festival was excited this particular filmmaker was attending. So, simple enough, I brought up a release schedule and looked at films that came out in the next couple months, had prominent directors, fit the genre flavor of the festival, and could hypothetically screen there. James McAvoy’s performance in Split is excellent. Photo: Universal. Immediately one movie jumped out: M. Night Shyamalan’s Split, which most of my friends agreed was a decent guess. So after we walked into the theatre, listened to the mysterious introduction and the lights went down, I was less surprised than most to see that the movie was, in fact, Split. It’s important, again, to note this was about four months before the movie came out in cinemas. 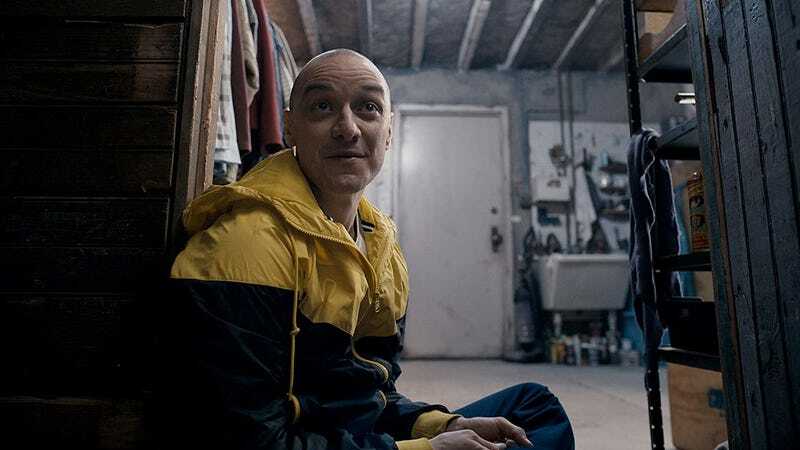 All we really knew about Split then was James McAvoy played a person with multiple personalities who kidnapped some girls, which was gleaned from the first and only trailer at the time, which came out in July of 2016. Honestly though? I don’t even remember watching that trailer. I had liked Shyamalan’s last film, The Visit (which I even interviewed him for), so I was optimistic about this new, low-budget thriller road he was taking. Fast forward about 112 minutes. I had enjoyed Split. It was well done, creepy, and with an incredible lead performance by McAvoy. You can read more thoughts on it in my review from the time. About 20 seconds into the below clip (which is the last two minutes and 30 seconds of Split) you’ll notice a few notes of music. Those notes of music, at least to me, were instantly recognisable as James Newton Howard’s score from Unbreakable, a scored I adored and listened to regularly for almost 16 years. Now, I can’t be 100 per cent sure of this next part—the other 300 people in that theatre were all very film savvy—but clocking in with a time of roughly 20 seconds, it’s distinctly possible I was the first person in that room to put this together. In fact, to this day, my friend swears that I was. If that’s true, since this was the film’s world premiere, it’s also possible I may have been the first general audience member to figure it out in the world. Unlikely, but possible. I digress. 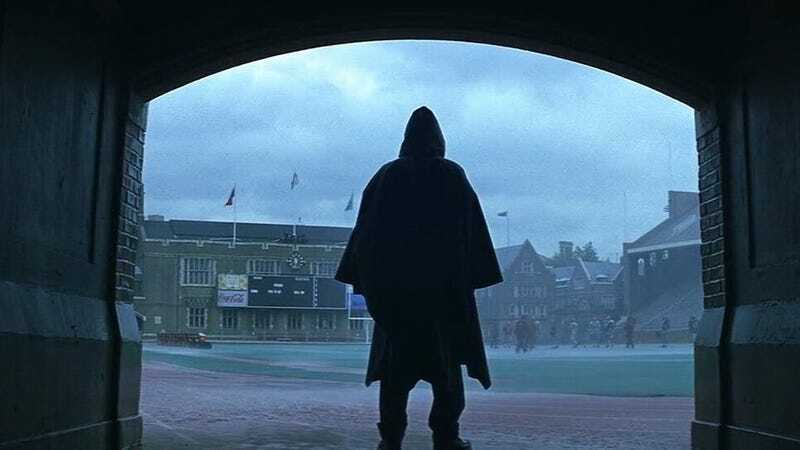 That idea of someone with power showing the world their true identity is the core of Mr. Glass’s beliefs in Unbreakable so I was sure Shyamalan was up to something related to that. I sat up further in my chair. The Unbreakable score then really kicks in as the “Split” title card comes up, marking the end of one movie but also letting the audience know something is still happening. It was at this point, I’d assume, other fans started to sniff out the twist. The film cuts to a diner with a TV playing the news. Howard’s score continues to play. After hearing a report on the events in the movie, a girl says “This is like that crazy guy in a wheelchair they put away 15 years ago. They gave him a funny name too. What was it?” And then, there he was. The big reveal. Bruce Willis himself, reprising his role from a movie released 16 years earlier, to answer the woman’s question. “Mr. Glass,” he said, making all my Unbreakable dreams come true. The score crescendos and the credits roll. I cheered. Loudly. I don’t remember much else. I’m sure there were tears (based on the fact that simply remembering the moment right now brings them up). I’m sure I said “I told you! I called it!” to the people around me. I may have even jumped out of my seat. It’s all a blur because, really, how do you react to something like that? When you find out the movie you’ve just been watching is actually a sequel to a film you have such a huge emotional connection to? If Unbreakable didn’t have the same impact on you as it did me, think of your favourite movie. For argument’s sake, let’s say it’s Back to the Future. Now, take that filmmaker’s seemingly unrelated new movie. Say, Welcome to Marwen. Imagine if, at the end of Welcome to Marwen, Michael J. Fox and Christopher Lloyd appeared in a brand new DeLorean and said to the main character, “Mark, we have to take you back to the future!” Yes, that’s an odd example but it’s almost less odd than imagining Split would have somehow been related to Unbreakable at that time. I freaked out. I buzzed about it. I’m still buzzing about it. There were tweets. Things like “Split is a secret sequel to Unbreakable!” “If you love Unbreakable, you have to see Split!” I was disgusted. I knew movie news sites would pick that up instantly and use the spoiler for their own benefit, and in the process ruin the possibility of other people having the electrifying experience I just had. That’s simply the world we live in. But, after Shyamalan said that, the tweets went away. Or at least were buried and forgotten. Time passed and though I wanted to shout it from the rooftops, neither I nor the other attendees of the festival did. It stayed secret. Soon, Split opened and was a hit, which allowed Shyamalan to complete his master plan, bringing everyone back together for what would become Glass. I even got to talk to him about the reveal at the time, which you can read here. And so, with great anticipation, I sat down last week and saw the ending of a story that has many great memories attached to it for me. And no, it didn’t turn out how I’d hoped. But if having Glass means I get to relive that incredible evening in September 2016 again and tell you all about it? Well, it’s worth it. Glass is in cinemas now. Unbreakable and Split are now on DVD and Blu-ray.